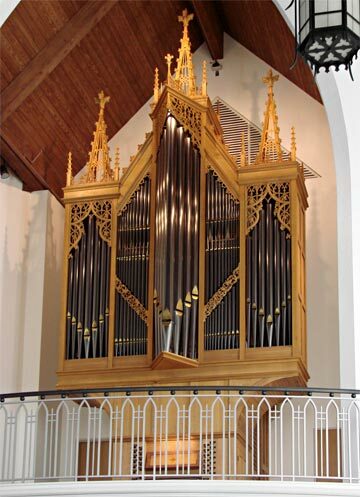 Discussions began in 2000 concerning an organ for a new chapel at the Duke University Divinity School. Agreeing with Divinity School Organist, David Arcus, the primary goal of the organ was to train future clergy and musicians. It is also asked to lead daily services (often with choir), and to complement the notable and diverse organs already on campus. The Goodson Chapel, replete with gothic details and stonework was a dream project for organ builder and musicians. We explored early gothic instruments for inspiration that would complete the vision of the architect and the timeless feel of the chapel. With the help of acoustician Dana Kirkegaard, the room presents a warm acoustical environment for both music and speech. The organ contains narrower pipe scaling, a variety of color stops, and projects a solid but unforced sound into the room.